Poke holes in muffin pan bottoms (for draining). 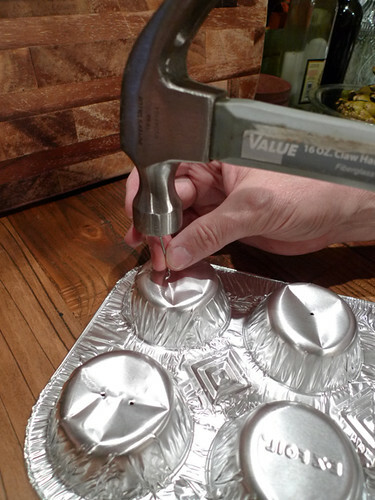 Place muffin pans on a baking sheet covered with foil to catch grease. 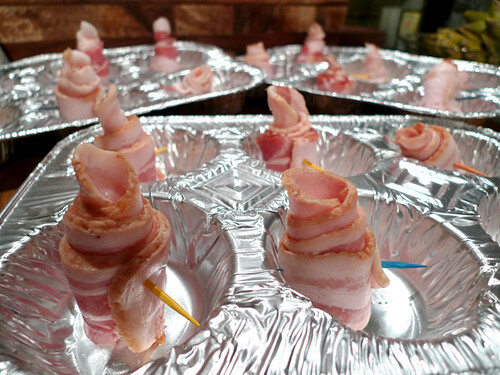 Roll individual bacon slices into “rose” shapes. 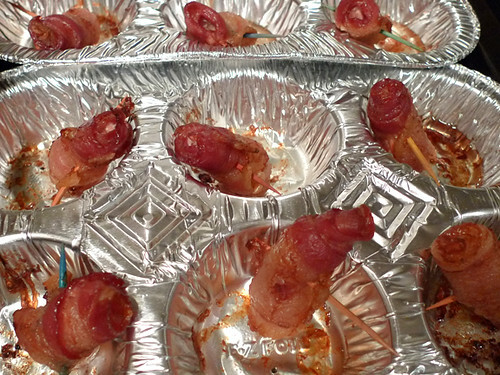 Secure with toothpicks and place one each into muffin tins. Bake until nicely cooked (depends on your oven). Gently remove toothpicks and replace (in same hole) with long skewers. 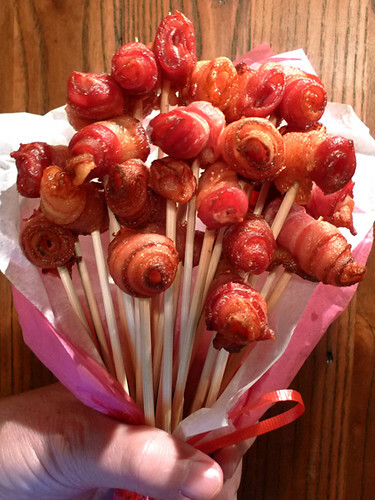 Present in a vase or bouquet to the pork lover(s) in your life. 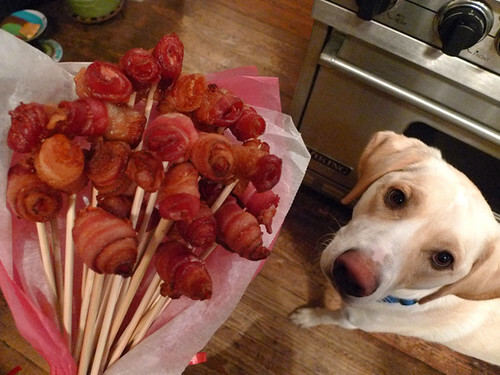 If you have a dog, please consider sharing at least one bacon rose! That last photo with the doggie is epic. Love. LOVE this – and esp love that last photo! This might be the most wonderful thing I have ever seen! Oh man I would fall in love with anyone who gave me this bouquet. Such a cute idea, I just love it. Thanks. Okay, this beats both the bacon bra AND the bacon tiara! 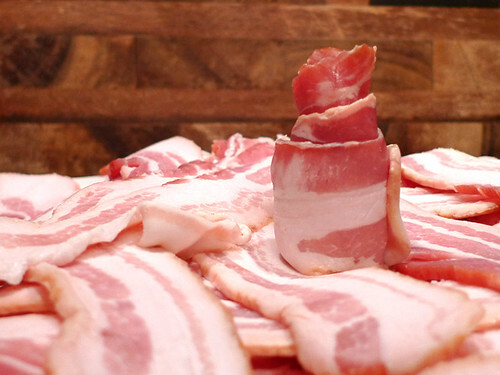 You are a bacon genius. 🙂 I love this! So crafty. I love these! 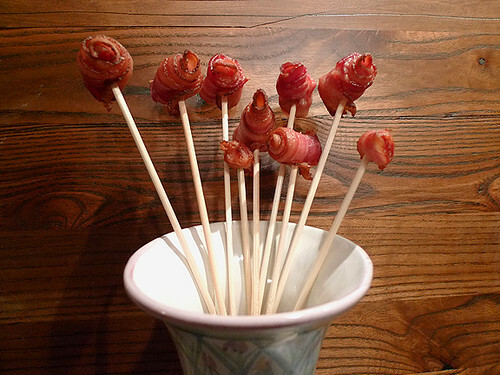 In fact I love these so much I borrowed the idea and a photo for my “Bacon Gifts for Bacon Fans” Squidoo lens. I gave you credit for everything and even included a couple of links to the instructions. Let me know if you don’t approve and I can always modify or delete it altogether. Thanks for the awesome instructions! Definitely doing this soon! Have fun in Scotland! I did a similiar rose except I wrapped them around cocktail weenies (cut in half) sprinkled with brown sugar. Divine! These look great! I’m making 2 bouquets. One for my husband and one for his weight lifting partner, they are both on the Paleo diet. Perfect! Just Awesome. Thanks for the idea.